Happy Women's Day to all women around the world! Today we are celebrating Mother's Day. A week after Martisor, this is another occasion to party and another holiday with considerable expenses. Once again men and children give flowers and small gifts not just to their mothers, grandmother, wives but to all women in their lives, from the kindergarten teacher to the family doctor. Each woman is expecting a gift on this day. You can see people carrying several flower bouquets on the streets, though in many cases, it's an exaggerated obligation with no feelings attached. Though officially Mother's Day should be celebrated in Romania on the first Sunday of May (since 2010), according to Wikipedia, nobody seams to have heard about this change, keeping its original date of 8 March. On the 8th of March the International Women's Day is marked in many parts of the world, as a Socialist political event, celebrating women's economic, political and social achievements. In several Eastern European countries and from the former Soviet bloc, this day has no political connotation but it is an equivalent of Mother's Day. U nas dzisiaj jest Dzień Kobiet i dziękuję za życzenia i wzajemnie wszystkiego dobrego. Pozdrawiam cieplutko. 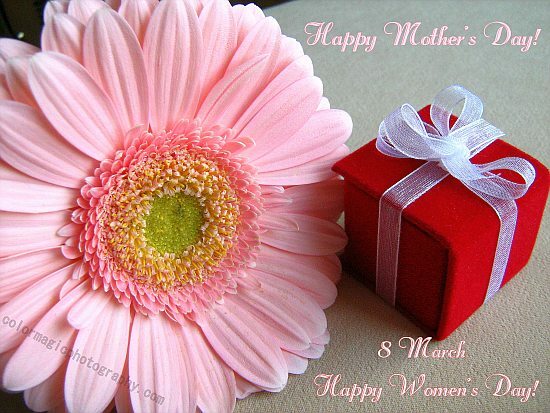 *** With us today is Women's Day and thank you for your good wishes and all the other good. Yours warm. March is Women's month in my country, Maia. Mother's day is in May and father's day in June. I wonder why there are no dog's day or child's day?